Michael Faraday (22 September 1791 – 25 August 1867) was a scientist, chemist, physicist and philosopher who greatly contributed to the fields of electromagnetism and electrochemistry. His main discoveries include that of the Magnetic Field, Induction, Diamagnetism and Electrolysis. Michael Farady was born at Newington, Surrey, now a part of South London on September 22, 1791. His father was a blacksmith who has migrated in search of work form the north of England in 1791. Due to ill health he faced lot of difficulties at work. His mother was a country woman of great calm and wisdom who supported her son emotionally through a difficult childhood. Born in such a family, he had to make do with the available education of alphabets and arithmetic from the Church Sunday school. Physically too, Michael was weak and skinny. Faraday had three other siblings and all of them could barely be fed as their father was ill and often incapable of doing any work. It is said that Faraday reminisced having lived on one loaf of bread for a week. Belonging to the small Sandemanian sect of the Christian faith, religion provided Faraday spiritual power to survive all adverse situations. This had the single most important effect on him that led him in quest of nature and approach towards life in general. One kind-hearted distributor of books gave him the job of distributing newspapers and at the age of 13, he employed him at his shop and also taught him book- binding work. Thus, his going to school came to an abrupt end. Finding time out of his working hours, he began reading books available there thus acquiring knowledge. He came across an exhaustive write-up on electricity in the third edition of Encyclopaedia Britannica which opened new vistas for him. This reading brought a great transformation in his life. He was so inspired by it that he went on to purchase necessary items to make a Leyden jar. Using old bottles and lumber, he made this crude electrostatic generator and conducted simple experiments. He also constructed a weak voltaic pile that helped him perform experiments in electrochemistry. As his interest in science increased, he joined the philosophical society there and began attending lectures, enhancing his knowledge. 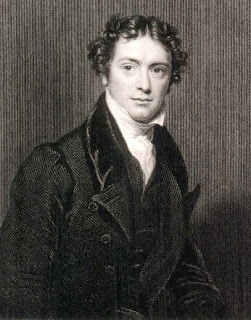 Around this time Faraday got the opportunity to attend lectures in chemistry by the famous chemist Sir Humphry Davy in the year 1812 at the Royal institution in London. This was the turning point in his life. He was inspired by the lectures. He copiously took down the notes and prepared a bound volume by hand. He presented it to Sir Humphry Davy, along with an application for a job. Alas, there was no opening! He even wrote a letter to the president of the Royal Society, Joseph Banks, requesting for an odd job there. He received no reply from him. However, Davy did not forget and in 1813, when one of his laboratory assistants was dismissed for misbehavior, Faraday began as Davy’s laboratory assistant and learned chemistry under one of the greatest chemists of those times. It is said that Faraday was Davy’s laboratory assistant and learned chemistry under one of the greatest chemists of those times. It is said that Faraday was Davy’s greatest discovery. Finally in 1815, he got promoted as assistant and was given the charge of looking after the laboratory instruments. In 1825, he was promoted as the director of the laboratory. He was now totally engrossed in his scientific pursuits. For several years he experimented the experiments that Sir Davy had performed. In chemistry, he performed electrochemical and metallurgical experiments. He made invaluable contribution in the invention of the famous ‘Davy Safety Lamp’. 1) The amount of a substance deposited on each electrode of an electrolytic cell is directly proportional to the quantity of electricity passed through the cell. 2) The quantities of different elements deposited by a given amount of electricity are in the ratio of their chemical equivalent weights. 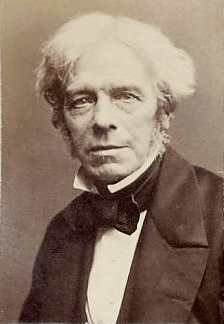 Faraday discovered benzene in 1825. Further, in 1831, he conducted a series of experiments giving clear picture on magnetism and also produced electricity by speedily changing the magnetic forces. In 1827, he was invited to join as professor of chemistry at the London University College which he modestly turned down. In 1833, he was selected for the Fullerian professorship of Chemistry at the Royal Institute. Meanwhile, he took up another assignment as part time lecturer at the Woolwich based Royal Military Academy. He even advised and directed other institutions during this period. Due to this shortage of time he had to face difficulties in his research activity. To ensure that he would not have to face financial difficulties and that he would direct all his energies in research, efforts were made to secure pension- financial assistance from the government. A meeting was arranged with the then Prime Minister Lord Melbourne for this purpose. During the meeting the prime minister passed some negative remarks. He went on to say that government grants and assistance were a big fraud or a kind of cheating. This was just enough for Faraday. He immediately rejected the idea of seeking assistance and thus, ended their eventful meeting. 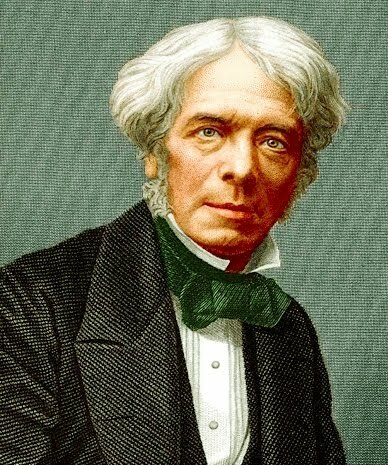 Some even believed that Faraday was known famously as ‘Narure’s great refuser’. He refused to take up the University College professorship. He even refused the proposed Knighthood award of the title ‘Sir’ from the government for which his prior permission was sought. Not only this, he was offered the presidency not once, but twice by the Royal Society for which he expressed his inability. He had quite a different view about all these awards and honours. In 1824, he was made the Fellow of the Royal Society. After a lot of deliberation and delays he accepted the same. Finally in 1835, Lord Melbourne was successful in seeking his pardon for the earlier rebuff and granting him government pension. For Faraday now, financial difficulties were a thing of the past. In the meanwhile, due to ill health his research was interrupted. Once again in 1845, he began his research- experiments. But now his efficiency had gone compared to what it was earlier. Prince Albert allotted a house for him in Hampton Court. He spent the rest of his life there. His research and inventions were unparalleled, wonderful and invaluable. In the electrochemical experiments he had conducted based on electrolysis, he separated certain elements. On its basis, he defined the unit of electricity- the ampere. By one ampere current we mean the amount of electrical current required to obtain 0.001118 gram of silver when silver nitrate is electrolyzed. On the basis of his experiments on electricity and magnetism, electric motor was invented. This important research of his established him as a great scientist. In 1820, a famous physicist of Denmark, Hans Christian Oersted announced the discovery that the flow of an electric current through a wire produced a magnetic field around it. Andre Marie Ampere showed that the magnetic lines of force were circular around the wire. In October 1831, Faraday gave an affirmative answer to this question. 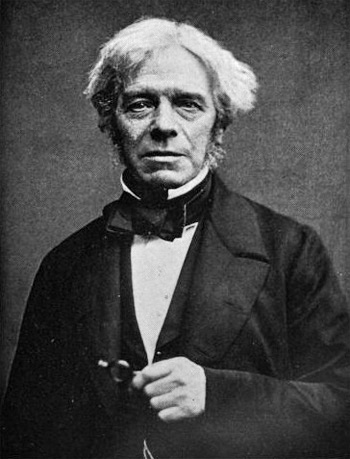 Faraday also gave the laws of electric induction. He explained that creating relative motion in magnetic and electric field, magnetic field can be transformed into electric energy. In fact the electric generator designed by Faraday is the original form of today’s giant size dynamo. 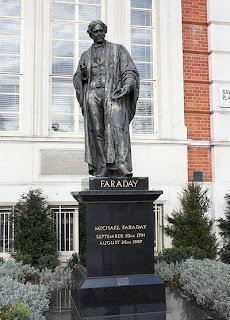 Faraday made a unique contribution in popularizing science by giving a series of lectures from 1826 at the London based Royal Society for children during Christmas. For years he gave lectures to children providing them an insight on various scientific theories. Even today, eminent scientists are invited to give lectures during the Christmas lecture series. Faraday is considered to be the inventor of electric motor and generator. The unit of capacitance, the farad, is named in honour of Faraday. He also made contribution in the field of optics. He observed that the path of plane polarized light is electromagnetic by nature. Faraday introduced the concept of field (now called classical field) to explain his observation in electromagnetic experiments. Since 1855, Faraday began to lose his mental abilities. He occasionally experimented on gravitation and other forces and conversion thereof. The Royal Society then refused to publish his negative results that he announced causing lot of disappointment to him. Further, Faraday began to sink into senility or a disease caused due to damage to brain cells in old age. Earlier, he had rejected the knighthood though he took up the residence at Hampton Court. He wanted to die as a plain Mr. Faraday. On August 25, 1867, this great scientist left for his heavenly abode and would always be remembered as a bright star shining in the sky forever.